Yesterday husband Walter pointed out an error in my post about members of the therapy team at Ocean Springs Hospital Neuro Rehab Center. In the cutline for a photo of physical therapy intern Abby and me, I had identified Abby as pictured on the right. It is unlikely anyone would mistake me for Abby. Nevertheless, I corrected the error, groaning all the while at my faulty directional genes. It is all my dear mother’s fault. Along with a bit of natural curl in my hair, I inherited her difficulty with distinguishing left and right. Such directional dysfunction is still inconceivable to dear hubby. But he has ceased exhibiting frustration and amazement. Those reactions I am sure still lurk, but he has become a master at masking them. When I have made a wrong turn or move, he seems to enjoy saying in a jovial tone, “No, your OTHER left (or right, whichever fits the occasion).” But I don’t think he has ever quite accepted the necessity of my map-reading strategy. I have found that my method is not uncommon. I have met at least a dozen other, okay, maybe three or four, people who do the same. If I am drafted as navigator and there is any likelihood that I will have to tell a driver where to turn and whether to turn left or right, I have to find on the map the thoroughfare we are currently on. I turn the map version of the road so that it is pointing in the same direction we are traveling on the real road. The next step is to find where we are to turn. With the map “correctly” oriented in the direction we are going, I can see in which direction we need to make the turn. And most importantly, I can make a little phantom handwriting motion with my right hand to double check that I have figured out correctly which is actually right and which is left. This procedure must also be accomplished before carsickness from looking at a printed page strikes and causes unpleasant consequences. Why not go with a GPS thingee? I am not sure. Perhaps hope springs eternal in the heart of man that his mate will one day comprehend north, south, east and west and be able to rotate a little mental map well enough to give accurate directions. Ha! I walked into our bathroom recently and saw my toothbrush stuck to the tile above the sink. Husband Walter had struck again to make me laugh. When my laughter subsided, I decided I liked having it handy but out of the way. Maybe it is childish, but I even find it fun wetting the suction cup on the bottom and whapping it onto the wall. For about five years I have been buying kids toothbrushes. I started out buying a child-sized toothbrush that was conveniently small for carrying in my purse.Then I realized it was also softer and easier to wield in the hard-to-reach dental regions beyond my front teeth. My recent purchase was, of course, the least expensive. Past purchases in the least-expensive category have been serviceable, nondescript solid-colored kid versions of adult toothbrushes. The brush above was whimsically molded with an interesting texture on the handle and bright colors galore. And then there is that suction cup with so much creative potential. I am sure that the delight this toothbrush engenders in me is a sign that I should expand my interests, get more serious about dental hygiene or maybe just grow up. I paid no attention to your right and left description, because I know what you look like and I knew right away which one you were. 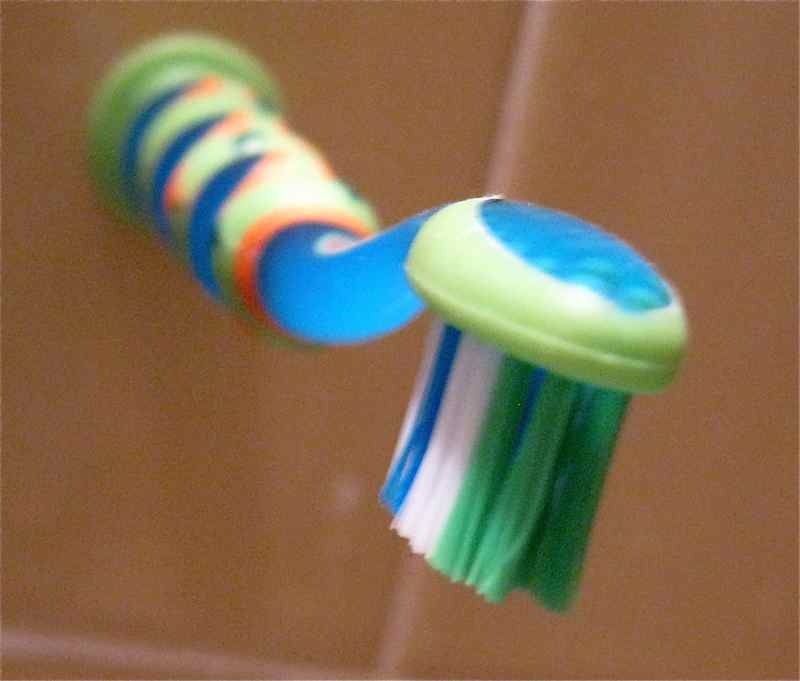 I have found out that smaller toothbrushes are able to get into places in your mouth where those big fancy brushes will not fit. Now I'm going out to buy the cutest kids toothbrush I can find! Two of my siblings and I share your difficulty with directions. Although my husband and I have been married 42 years, my husband keeps trying to give me helpful hints such as remembering landmarks. I explain to him that you can rotate 360 degrees around a landmark, so just recognizing a landmark isn't a sure-fire help. My sister and I once spent a hilarious 30 minutes on a street in a historical district of San Antonio, trying to bend over far enough so that we were oriented correctly on the map placard of the historical district fixed on a lamppost. That was the only way we could determine how to get to the next location. Unfortunately, we probably would have been arrested for tearing the placard off the lamppost and turning it the way we needed. It's not an intelligence thing or a not-trying-hard-enough thing. Left and right, children and pets, husbands and exhusbands, I can get confused about anything. Done it all my life. It is not a sign of mental deterioration. As for kid's toothbrushes, why not. I like the colors. I used to keep them here at my house for kids to brush teeth when they visited. That and little paper cups to reduce my exposure to kid germs. I just use my hand to rinse my mouth - no cups for me! I don't have any trouble determining right from left, so can't quite understand your "disability." I hope you have a wonderful weekend!!! I had a friend with your right/left difficulties. Actually it is comforting to realize there are others. Think I will send her your link so she won't feel alone. I don't have directional problems usually, but there are times when I really get mixed up when I am in Denver. I could swear that I walk in a store, walk out again, and someone has rearranged the city with things going in the wrong direction. I love your little toothbrush. I've never seen one of those. Cute.